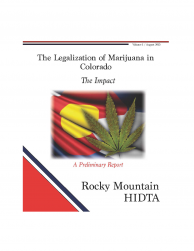 The purpose of this report and future reports is to document the impact of the legalization of marijuana for medical and recreational use in Colorado. Colorado and Washington serve as experimental labs for the nation to determine the impact of legalizing marijuana. This is an important opportunity to gather and examine data and facts on this issue. Citizens and policymakers may want to delay any decisions on this important issue until there is sufficient and accurate data to make an informed decision.